Hoarding Data – Are you buried alive? Big Data is an overhyped buzz word used by software providers to persuade organisations that they need to add one more ‘magic pill’ application into their already complex information environment so that they can find stuff. Now I’m all for innovation and automation when it’s needed. But here’s an idea. Let’s stop adding more and more complexity into our environments and actually clear out the dross first. Then what we do find will be far more relevant. I had a long day at the office the other day. And it really had been a long day. I’d spent what felt like an eternity talking to a client about developing a business case for cleaning up their network shared drives and improving the way the use it. The whole notion just seemed so silly – not the improvement part mind you – the part where we have to bend over backwards to quantify the problems they were having with the network shared drive. This organisation was drowning in information and feeling the effects every day. What more justification do the Executives need? Anyway, after this very long day at the office I poured myself a glass of red whilst I started making lunches for the next day, tidying up the house, and sneaking a cheeky load of washing in – working parents out there will know the drill. To keep me company I had the TV on in the background. But what started out as keeping me company actually stopped me in my tracks (I never got that load of washing done) and had me reluctantly glued to the sofa for the next 45 mins. Reality TV. Now before you go judging me for watching Big Brother, I’d been sucked in by... wait for it ... Hoarders! And as I watched, horrified, as the drama unfolded, I was actually watching the same thing that I’d been talking about earlier that day. Here were people who, for whatever reason, were unable to let go of things they accumulated over the years. The reality folk started fretting at the thought of someone making decisions and getting rid of their things, just like the organisation I’d been speaking to earlier on in the day. Stacks of cardboard boxes and papers had become a way of life for the hoarders. Nested upon nested upon nested folders of legacy information has become a way of life for that organisation. So I sat there mesmerised by people holding on to stuff that had been important once; old tennis racquets – “I used to play tennis 20 years ago” said one very offended offender - and other such items that they didn’t realise were now not only of no use to them, but actually out of date and causing problems in their day-to-day life. Like not being able to actually make a cup of tea in their kitchen, and living side by side with families of rats. And at the mention of rats, that is where I’m leaving the hygiene discussion. But what was truly heartbreaking in all of it was that amongst the old clothes, rubbish and piles of dirty dishes (and that was just the lounge room) was a diary. And that diary was written by a father who knew he was dying and wanted to leave something for his son. So he wrote and wrote and wrote to his son. But this boy had never known the diary had existed until the rubbish was removed. He was transfixed when he found it, and we watched him transform as he read it. A huge weight of sorrow lifted from his shoulders, he walked taller and had a positive energy about him that had not been evident before. I don’t think that we’ll ever find a buried diary in my house. I don’t like mess, don’t like a lack of clarity, and get very frustrated searching for the sticky tape for 10 mins when I wrap a present because it’s not in its usual place. Give me an area to sort and hoarder. In fact I’m the opposite of a hoarder (is that a minimalist?). So I guess it’s no surprise then that I’m a consultant – I like structure, rules and discoverability of an organisation’s information. 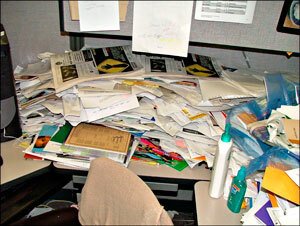 I like to sort and de-clutter for my clients. But people always ask me ‘shouldn’t we keep everything just in case? What I tell them is that the older the information is, the more your organisation loses track of it. It becomes buried in old systems and archived into the world of back-up tapes. And apart from the wildlife (moths and silverfish are a common finding in poorly stored hardcopy records), the costs involved of storing information forever are extortionate, and what about the risk of losing control of the information or for it being used inappropriately? Bottom line is that it is riskier to keep information forever than it is to have a properly authorised and implemented Retention and Disposal Authority (RDA). And the better your retention and disposal program, the better you are protected against breaches. Why? Because an RDA program tracks information better. You either have to assess the information to give it a retention period, or it is stored in a defined location; so the information is generally better tracked. Similarly, a proper disposal program ensures that information is destroyed appropriately and not just chucked in the wheelie bin out the back. As we see with the new Privacy legislation and associated principles becoming law in Australia this April, it’s more important than ever to make sure this doesn’t happen for the personal information we hold. Remember, most of the information we store as organisations is transactional and temporary in nature. So it is useful now as information to facilitate business activities; but we generally won’t refer to it again unless there is an issue. And that’s why hoarders can’t let go – perhaps we’ll need it again, perhaps there will be an issue... But our hoarding is drowning us in rubbish. We need to tackle Big Data head on by de-cluttering and clearing out the dross. So here are a few suggestions for tackling Big Data. Don’t call it Big Data - I hate the term, I hate that it implies it is one issue that can be addressed by a new application, and I hate the capitalisation! Call it what it is – an overwhelming avalanche of unclassified, unstructured information. That way, it doesn’t sound as ‘fixable’, so your organisation is less inclined to implement a quick fix. Use what you have - So it will take more than a quick fix. Well, implement a working party or project team. Look at developing a legal risk model like the one John Montana described in the last edition of IDM. Get a consultant in, brainstorm ideas that only require the current resources or systems you already have. You’ll be surprised with what you can come up with. And because you do not have to invest hundreds of thousands of dollars in new systems or applications, your return on investment (ROI) margins will be huge. Think of the terabytes of data you’ll be able to get rid of off the network drive! Tackle the legacy information. - Tackle the information being created now. Ok, so you’re implementing a project to clean up your legacy information. But what about the information that is being created now? You need to make it easy for the people in your organisation to know where to create and save their information. You don’t need a new system to save contracts in just yet. You just need clear processes and guidance as to where to save them. You’ll get less duplication, and you’ll be able to manage the information better in the long run. Track your progress - Because you are working with an overwhelming avalanche, it’s hard to see your progress. So track it. Measure what level of information is there before you start work, in terms of number of items and storage size and measure it after. And to ensure you can report on ROI, quantify it in money savings - because the Executive team need bottom line figures. But my number one tip for tackling Big Data? Implement an RDA & destruction program - It would be no surprise that I love a good Retention and Disposal Authority (RDA). For those of you that are very impressed that such a thing exists, but have no clue what it is or how it works; based on appropriate legislation, an RDA outlines the length of time for which your organisation will retain information, depending on content. And importantly, when your organisation will destroy this information appropriately. Sort and declutter. Unfortunately, whilst RDA’s are a fantastic records management tool, and a lot of blood, sweat and tears usually goes into developing them, I see little evidence in them actually being implemented. My theory is that most people have hoarder tendencies and so it’s a scary task to sentence a piece of information to 7 years retention life, and even scarier to destroy it at the end of those 7 years. But now that you’ve given people clear guidelines where to create and save their information, it is far easier to assign retention periods to it, because you know that only contracts and their supporting information are stored in that area. And for those hoarders who are worried that perhaps you may need the information in future … yes, perhaps. But there are multiple pieces of Australian legislation that state clearly how long to save information. So if you follow this legislation, and dispose of your information at the appropriate time, you have a highly defensible destruction program. And perhaps you may want to start playing tennis again after 20 years. But will that 20 year old racquet be up to the job? Will it still be relevant? You won’t care. You’ll be reading a diary. Kate Fuelling is General Manager and Principal Consultant of One Umbrella Consulting. kfuelling@oneumbrella. com.au.